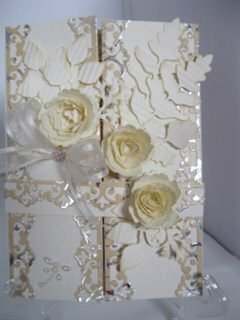 Gatefold Cards are easy enough to fold and this will show you how. 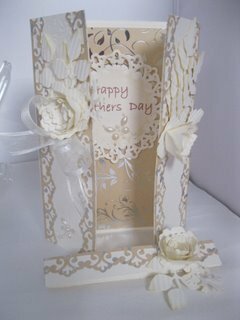 Then once you have the basic shape then you can create this beautiful card for yourself. Then add this to the repertoire of cards that you can create from the basic set of Spellbinders that we have been using. Let the video show you the steps you need to take to make this card and then stand back and feel the glow as the praise is said for such a gorgeous card. ... the inside can reveal the verse or sentiment that you have added to suit the occasion and the recipient. The card that I have used on both of these is a foiled card from Hunkydory Crafts and it comes in many patterns and colours. 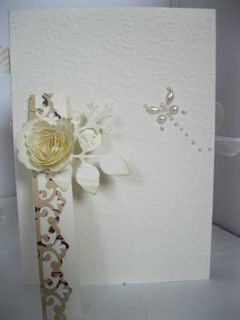 It is beautifully textured and would make any card look special. The added little finishing touch to this card is the back. When you make a card that you want to impress with, then paying some attention to that area makes it look that extra bit special. 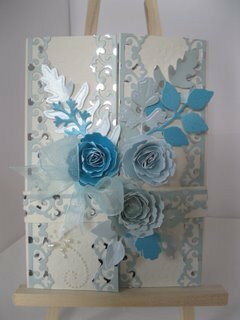 So if you have made a start with your collection then why not add this Gatefold Card with Spellbinders to your list.